Perhaps we should switch to something more organic and pricey body care. Or perhaps, we should do some body detox/cleansing every now and then to help remove any harmful toxic that may remain longer in our body? In fact, according to a new report, most of our favourite cosmetics are cocktails of industrially produced and potentially dangerous chemicals that could damage our health and, in some cases, rather than delivering on their potent 'anti-ageing' promise, are causing us to age faster. Many of those are also used in products such as household cleaners, and have been linked to a number of health problems from allergies and skin sensitivity to more serious hormonal disturbances, fertility problems and even cancer. Parabens, for example, which are designed to preserve the shelf-life of your cosmetics, are one of the most widely used preservatives in the world, and are found in shampoos, hair gels, shaving gels and body lotions. But their use is becoming increasingly controversial - a range of different studies has linked them to serious health problems including breast cancer, as well as fertility issues in men. Research from the Kyoto Prefectural University of Medicine suggests that some parabens we had previously presumed to be safe, such as Methylparaben, may mutate and become toxic when exposed to sunlight, causing premature skin ageing and an increased risk of skin cancer. Methylparabens are found in more than 16,000 products, including moisturisers and toothpastes. Cosmetic producers have always defended their use of parabens on the grounds that they can't be absorbed into the body. Beauty confidential: My hair is brittle and lifeless, what can I do to get back the shine? There are a number of laws designed to protect us from dangerous chemicals in cosmetics, but researchers worry that they don't go far enough. For example, cosmetic manufacturers are required to list their ingredients, but they don't have to tell us about any impurities found in the raw materials or used in the manufacturing process, so long as they don't end up in the finished product. They also say that any chemicals are present in safe doses that can't harm us. While that may be true, there is some disagreement over what constitutes a 'safe' level - for young people and children, or sensitive adults, these levels may not be so safe at all. And even if the relatively small amounts in individual products don't hurt us, there is growing concern over the number of products women use daily, and the cumulative effect of so many chemicals being used all over our bodies every day, for many years. As Charlotte Smith, spokesperson for Bionsen, says: 'Women have never been more image-conscious and their beauty regimes have changed over the years, from a simple "wash & go" attitude, to daily fake-tan applications, regular manicures, false lashes and hair extensions. If you want to protect yourself from chemical overload, reduce your overall cosmetics usage; switch to natural or organic products, and read the labels on your beauty and grooming products with care. 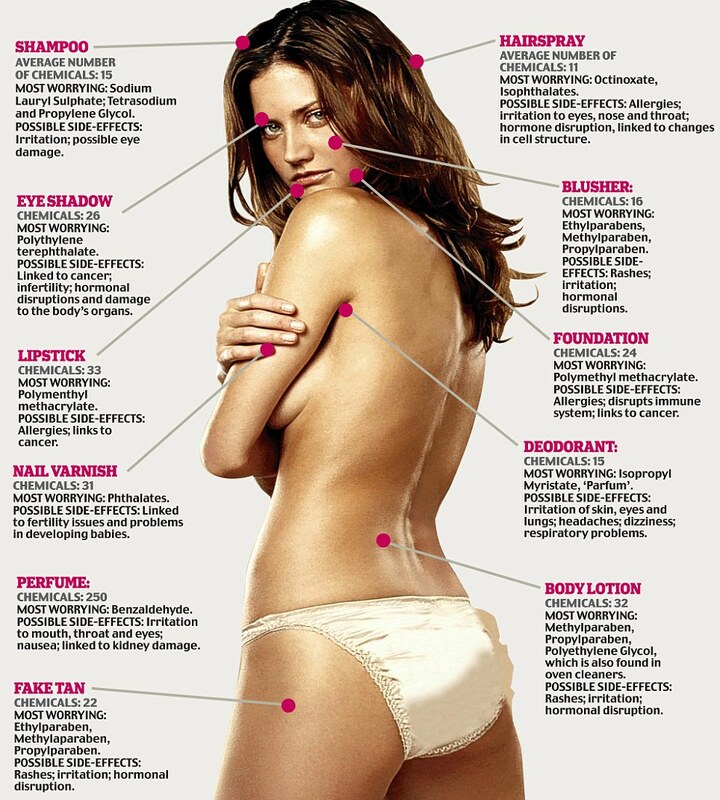 The Women's Environmental network has more detailed information and advice about ingredients contained in beauty products: www.wen.org. uk; The Cosmetics Database, a website which gives a 'hazard rating' for products: cosmeticsdatabase.com. Or read Skin Deep: The Essential Guide To What's In The Toiletries And Cosmetics You Use (Rodale), by Pat Thomas.